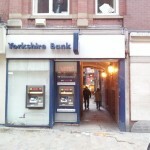 Think it’s a Yorkshire Bank? It’s not! It’s the front of Angel Inn Yard! Samuel Smith’s pubs are a Yorkshire institution. They are known throughout Yorkshire and elsewhere for their determination to keep things done the old way: the brewery owns the pub, provides accommodation for the landlord, serves only its own drinks (even the crisps and pork scratchings are their own). They even delivered their casks by horse-drawn cart until very recently. They’re also known for being cheap, although less so than they used to be. 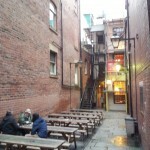 Angel Inn Yard, with its surprising beer garden. Because of their fame, Leeds can hide its Sam Smith’s pubs away and still do very good business. The Angel is very well hidden. 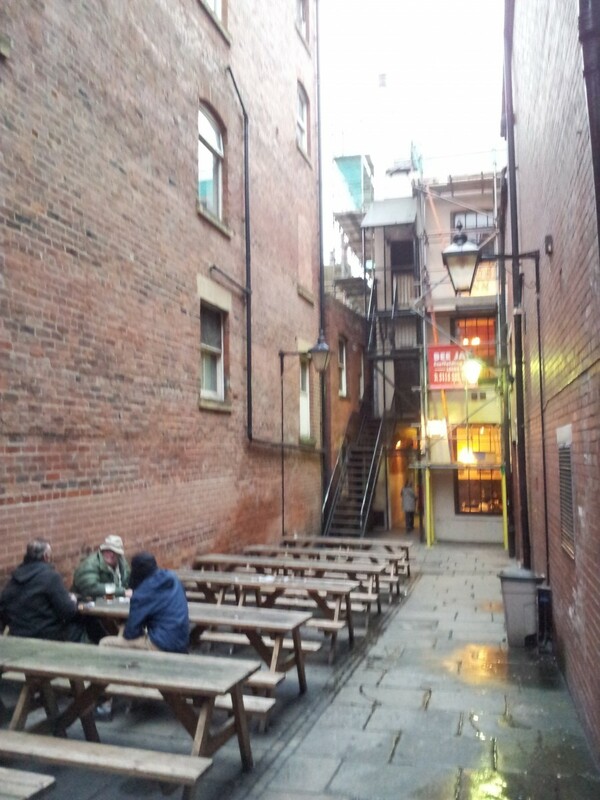 It’s in one of the alleys off Briggate, and with very little external signage. 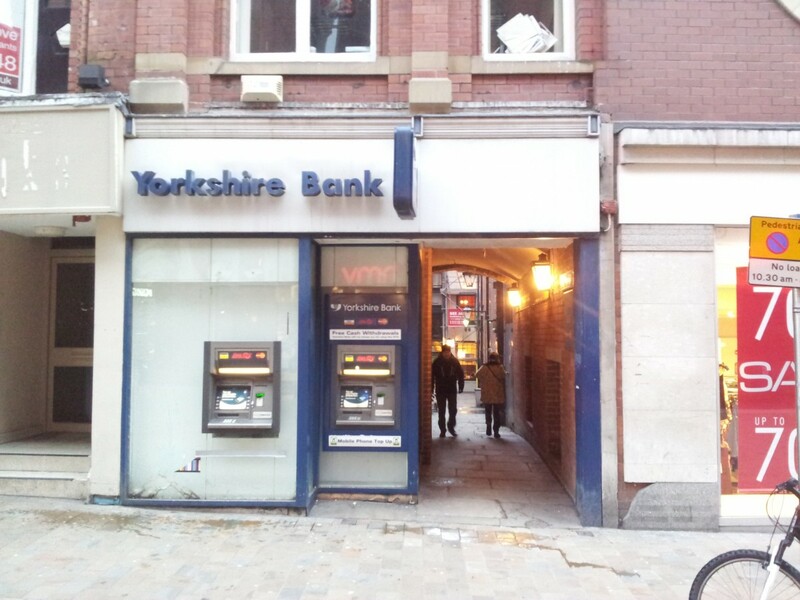 On Briggate the entrance is in the side of Fat Face and on the Lands Lane side it seems to be hidden behind a false Yorkshire Bank. There’s a surprisingly large beer garden in the yard, which could be quite nice in the summer even though it’s walled off. Inside there are two small rooms, one with the bar, and some steps to a larger upstairs area that is often closed (it was when we were in there). There’s an open fire and the tables are all quite close together so it’s nice and warm on a winter day. The Angel used to be famous for its sticky floors but they have been replaced recently too! This is about the extent of the Angel’s signage. Sam Smith’s pubs always attract characters, and this one is definitely no different. Sitting here at any time is very much like having your own soap opera to watch, and you may be expected to participate as well. As soon as we sat down we immediately began a conversation with our neighbour, which was nice but you definitely wouldn’t want to go here to have a private chat or a quiet night out. 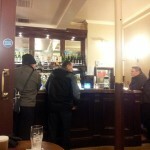 Unusually for a city centre pub, the Angel definitely has regulars that the staff know by name. If you go to a Sam Smith’s pub, you only get a choice of Sam Smith’s drinks, but thankfully they have a very nice selection of beers. As well as their classic Old Brewery Bitter (at £1.80 a pint!) they have three different lagers, mild, stout, wheat beer, and a handful of bottled beers including strawberry and apricot varieties. All their beers are vegan and several of them are organic. Not a bad selection for a tied house! The bar area. I kept trying to get a clear shot, but this place is popular! There’s also food served at lunchtimes Mon-Sat, but I don’t know anything about what it’s like or the selection available. 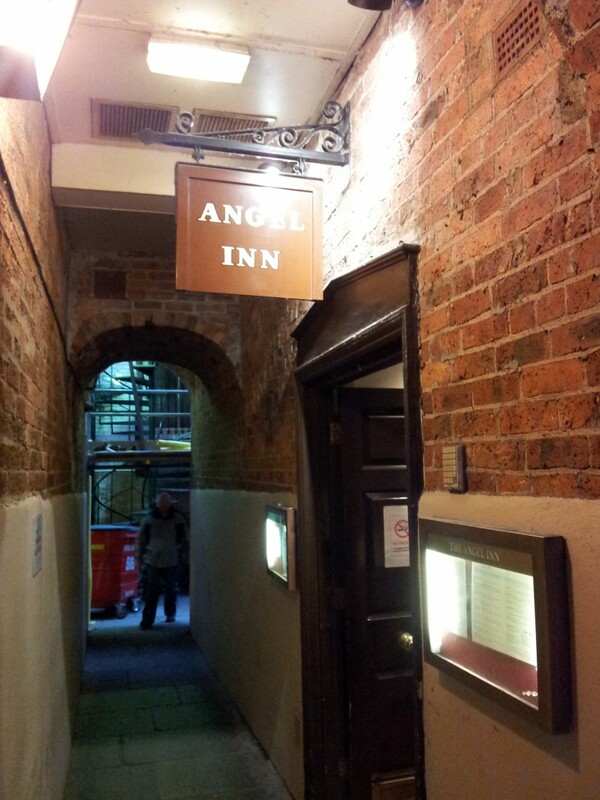 I definitely wouldn’t call the Angel a gastropub. If you’re looking for a slice of real Yorkshire life, this is the best you’re going to get in central Leeds. Practically every Yorkshire village has a Sam Smith’s pub, and the Angel brings something of the village pub character (and characters!) to the city landscape. It’s a bit rough. But in a good way! Service was good on a noisy Friday night. Seemed a decent place and I will go back on my next visit to the theatre. But the guy who wrote this lives in another world!! 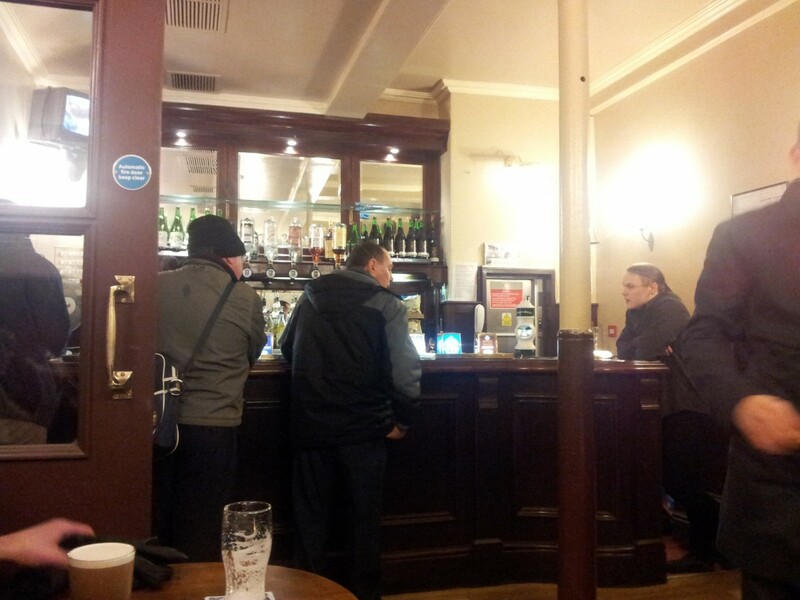 “Samuel Smith’s pubs are a Yorkshire institution. They are known throughout Yorkshire”. Well, no, not any more they’re not. I’ve lived up here for 7 year now and I’ve not come across ONE SS pub. Not sure if the Angel is or not – but this side of Leeds they’re certainly an unknown quantity to me. I know of one in Lancashire (Petre Arms). And believe me I would LOVE to find Sam’s!! Yorkshire institutions would be Copper Dragon and Black Sheep these days. Sorry to hear you can’t get Sam Smith’s where you are! They’re still all over North Yorkshire where I grew up and there’s no shortage of them here either (three in the city centre alone: read our reviews of Old Red Lion and The Duncan for details). If you have lived in Yorkshire for & years and never seen a John Smiths pub you can’t be getting out much! Worst landlady I’ve come across in a Sam smiths pub always swearing ! The custom is from every walk of life which creates a great atmosphere. How can you give this place 2 1/2 stars for atmosphere? The alley location, the lamp lights, the sense of musty Victorian allure and slight sleaziness. The real fire and the main bar with a throwback selection of crusties and eccentrics. The Angel Inn is definitely rough around the edges but it’s a mixed bag, the oddballs can be kept well at arms length, and you get to hear some authentic old accents and natter with it. Sam Smiths is a relatively unique setup in terms of drinks and despite a pint of bitter climbing from £1.37 in 2008 to £1.80 in 2014 that is still one of the cheapest pints going. It’s actually nice as well, rather than John Smiths or Tetleys. The food is very workaday ordinary, but feels a tad less plastic than Wetherspoons. 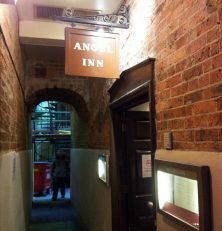 I would always take people to the Angel.